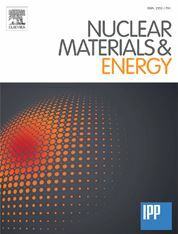 The open-access journal Nuclear Materials and Energy, now indexed in the Science Citation Index Expanded, is devoted to the growing field of research for material application in the production of nuclear energy. Nuclear Materials and Energy is supported scientifically by the Max-Planck-Institut für Plasmaphysik, Garching. Fusion reactor materials, including plasma-facing components, such as divertors, limiters blankets, and the first wall. Material erosion and transport in the boundary of fusion plasmas and its effect on the incident plasma conditions. Interaction of plasmas, ion beams, electron beams and intense heat fluxes with materials with emphasis on lifetime, tritium retention and permeation, and structural stability. Fission reactor materials, including fuels, cladding, moderator, control rods, core structures, pressure vessels, but excluding fuel cycle from mining to nuclear waste. Fusion and fission reactor materials enduring radiation doses at very high temperature far beyond the capability of materials now available for components. Materials behaviour in the interaction with reactor coolants during normal operation and in accidental conditions. Materials behaviour addressing the release of fuel, activated dust and reaction products during accidental conditions, and the physical and chemical interactions of reactor core and containment materials. Neutron and charged particle radiation effects in materials, including defects, gas retention and permeation, transmutations, microstructural changes, phase changes and macroscopic properties.